Some of you may have noticed that I basically disappeared. I have a new job, working five days a week, and I have been spending the rest of my free time with my young daughter. I have not been able to write for months, but I’ll get back into it when the time is right. However, I could not miss the opportunity to promote the cover reveal for the second edition of my favourite self-published book! The Exercise of Vital Powers was written by Ian Gregoire, who became a good friend of mine during my short-lived blogging career. I absolutely loved the first edition of his book and so I have even higher expectations for the second edition! I am really looking forward to it and I definitely recommend that you all take the time to have a look. I’ll be completely honest, I am someone who tends to at least partially judge a book by its cover. Had I not seen an amazing review of this book I may not have even decided to pick it up. I am definitely glad I did though! And now for the moment you have been waiting for since you opened this blog post. 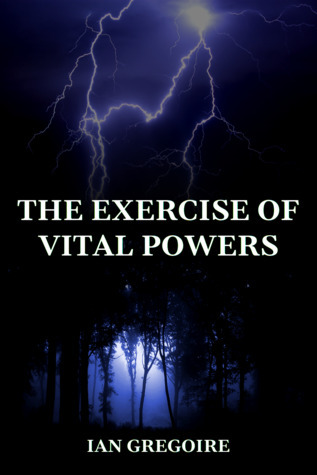 Here is the cover for the second edition of The Exercise of Vital Powers! I think everyone will agree that there has been a significant improvement. I love the contrast of the colours and I think the image really depicts the essence of the story within. I already loved this book but this new cover makes it even better! Ian Gregoire’s debut fantasy novel was self-published with no fanfare in the spring of 2017. On a whim, he entered the book into the SPFBO competition organised by Mark Lawrence two weeks later, and was just as surprised as everyone else when The Exercise Of Vital Powers was selected as Kitty G’s first semi-finalist. The book subsequently garnered a number of positive reviews, culminating in a place on the longlist of nominations for Best Self-Published Novel in the inaugural BookNest Fantasy Awards. Originally written and published as a stand-alone novel, the soon to be released second edition of The Exercise Of Vital Powers is now book one of a five book series called Legends Of The Order. Readers who missed out the first time around will now have the opportunity to acquaint themselves with the book’s precocious protagonist before she returns in the sequel, coming soon. The Exercise Of Vital Powers is due to go on sale from Monday 2nd July 2018, in ebook and paperback editions. Pre-orders will be open in June via all the usual online retailers. Ian can currently be found (or not) living the life of a hermit somewhere in London, continuing his quest to become your future favourite fantasy and science fiction author. To find out more about him and his ongoing publishing journey be sure to visit his official online hangouts. Have you read The Exercise of Vital Powers? What did you think of the first edition? Are you planning on keeping an eye out for the release? How do you promote (or plan to promote) your books? There are lots of ways to get your work out there! When I eventually publish a book I would like to do a cover reveal and a blog tour with interviews and giveaways. Other than that, I have not really put much thought into it. I guess it still seems to be such a long way off, I have lots of time to sort out what I am doing. Obviously, some ways of promoting books are better than others. I would love to hear what has worked for you in the past, what hasn’t worked, and what you would do in the future. Speaking of blog tours, book promotions and author interviews are something that I am hoping to get into soon, so if you are releasing a book soon and want me to write a post about it then feel free to send me a message via the contact page! How do you promote (or plan to promote) your books? What have you learned from book promotions? Writing exercises are a good way to find motivation and to get back in the flow of writing. I have not used any recently, but I enjoy setting aside a bit of time to write from a prompt. My favourite ones are the picture prompts, but the word ones can be interesting too. I usually know if I am going to write something within the first few minutes of looking at a prompt. Either I find inspiration instantly or I move on. They are not something I force myself to do. One of the things I really love about prompts is that other writers come up with completely different ideas. It’s really interesting to see how people interpret what they see. I think my favourite writing prompt that I have done is Tower. The photo came from Sue Vincent’s Daily Echo. I am considering adding writing prompts as a regular post on my blog. I would love for others to join in as well! Do you use writing prompts? What are your favourite types? Would you be interested in seeing writing prompts on this blog? Do you use other types of writing exercises? I would like to announce the release of Drakin: The Story of Raiya! This book has been on my WordPress TBR list since the cover reveal and I am very excited that it is now available! It can be purchased from Amazon, Barnes and Noble and other book retailers. The official release post can be found here with a sample chapter and you can also find the synopsis from Goodreads at the end of this post! I would like to wish James Harrington all the best with the release! If you read this book, don’t forget to leave a review and let me know what you think! “Abomination, freak, monster…” You get used to names like these when you have yellow eyes, horns, and scales, but Raiya could have really cared less. What she doesn’t know is that her journey will strike at the very heart of the Red War and uncover truths about her past that she may not want to know. Can she finish what she started while coming to terms with the truths of her origin? Going for something a little different this week. I don’t have a specific question in mind, but I am curious to hear about what you are working on! The Power of Whispers is a heroic fantasy novel that sits at about 90k words. It is a stand alone book that is set in a world that I plan to write other books in. The story follows Rami on a journey of self-discovery as he tries to escape the dangers that face him. There are several other side characters as he meets people along the way. Some of these characters might get their own books or novellas later. I have talked a lot about my WiP on here. What I really want to talk about is your WiP! Feel free to add descriptions, progress updates, possible release dates and any other information. Plugs are welcome. Tell us about your WiP! How many projects do you work on at the same time? When I was writing the first draft of The Power of Whispers I was determined to only work on one book at a time. If I had ideas for another story, I wrote down some notes, I even allowed myself to think about that story in my spare time, but I never actually worked on it. I thought it was best to remain focused. I’m feeling as though I might be better off at least doing some kind of writing though, even if it’s not always attempting to edit. I have a short story in mind for one of the minor characters in The Power of Whispers, so I might work on that for a while just to help me get back into things. Angel of Shadow is now available for purchase! I have recently reviewed this book and I would definitely recommend it! The blurb written by the author can be found at the bottom of this post, though I suggest you only read it if you have read book one already. If you have not read book one yet, it is currently free! Here’s the link to Wormwood on Amazon. You can also see my review for book one here. 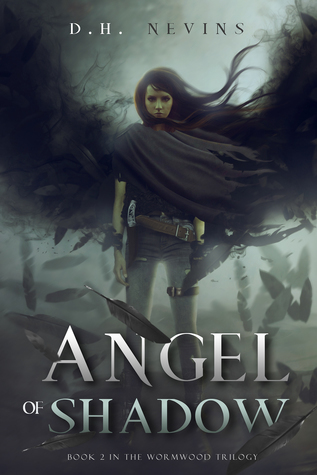 D. H. Nevins is hosting a GIVEAWAY for two paperbacks and five ebooks of Angel of Shadow! It is open internationally until the 5th of February! She is also starting up a newsletter if you want to sign up! Let me know if you are interested in this book! I would love to hear your thoughts! I received this book as part of a give away promotion before the release. I only write summaries for the first book in a series because they give away spoilers. You can see my synopsis and review for book one here or read the Goodreads synopsis for this book. I mentioned in the review for book one that I did not feel as though I knew Kali as well as I should after finishing a book. I connected with her more during book two and I understood her motivations and thoughts. Kali goes through some changes and I found it really interesting to follow her struggle and self doubt. There was a point near the end that bothered me, when Kali seemed to take her time to really get involved, but overall I thought she was a well developed character. I’m not sure why I did not mention Richard in my review for book one. He is definitely coming out as one of my favourite characters in this series. He seems perfectly deceptive and manipulative. He is exactly what I would expect from a menacing demon and I enjoy the encounters with him (does that make me evil?). Different characters are introduced and I found most of them to be interesting and well developed. There was one that did not feel quite right during the book but it was explained later and her reactions to situations made a lot more sense. This book follows a similar slow pace as the first one, with the majority of the story taking place over a few days. 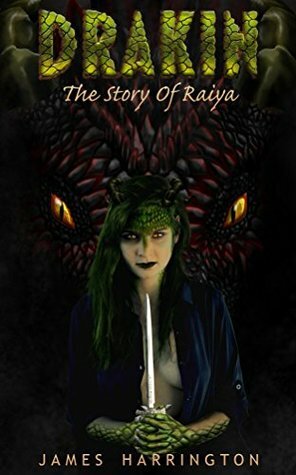 I enjoyed the pace and I thought it allowed the reader the opportunity to really get involved in what Kali was experiencing. Similar to book one, there are things that happen in this book that do not seem to quite add up as you read through the chapters, but it all makes sense by the end. I was actually quite surprised by some of the explanations and I really enjoy it when plots are not predictable. There was one aspect of the plot that seemed repetitive and I struggled to understand why the characters did not grasp the situation and continued to make the same mistakes. An explanation was provided but I do not think it was enough. There were some interesting changes to the world that I cannot mention without giving away spoilers. I also felt as though the use of shadows was unique and clever. I found myself a little lost with the description of some of the caves and I do not think I pictured the area correctly. This bothered and confused me slightly but only for about one chapter. I found a few tiny errors and some of the descriptions and explanations were a bit repetitive, but most of the book is really well written and an easy read. I think this is a great achievement for a new author. Just like book one, book two is difficult to put down, especially if you like stopping at the end of a chapter. You are often left with a hint of what will happen next and it makes you want to keep going. This is another enjoyable book by D. H. Nevins, with interesting concepts and a well thought out storyline. I would recommend this series to anyone who enjoys dystopia or paranormal genres, but I would also recommend it to those who want an unpredictable read. I really liked the little surprises. Angel of Shadow will be released on the 13th, so not long to go now! Let me know if you plan on reading it or if you already received an ARC. I would love to know your thoughts. Do you have specific writing times each day/week? I’ve mention many times before that I have a young daughter and that spending time with her limits my time to write. I’ll make it clear right now that I do not say that as a complaint. I love spending time with her. However, her naps are at different times of the day and go for different lengths of time. It makes it impossible to set up real schedules or any kind of routine. The only time I know I can set aside is Wednesday mornings. My daughter goes to childcare for a half day and I strictly avoid making other plans for that time. The childcare was closed for a few weeks over Christmas though, so I’m feeling even more out of touch with my writing. Then there is the fact that I should start looking for work. That will take up even more of my free time and I expect I’ll be too tired after long days to do any writing. My daughter will then only go to childcare when I am working, instead of giving me free time to myself. So I would like to know if routines work for others, especially if you have other commitments, like children or outside work. Are you able to maintain a balance in your life?